ERD Commander 2002 can save you time by avoiding rebuilds. You know the scenario. You get the call that someone rebooted the server and now it won’t boot. You try the obvious: NT boot disk, Windows 2000 ERD, Recovery Console. Unfortunately, none work for you. What now? Time to pull out the Windows 2000 CD and rebuild the server. By the time you patch and service pack the server and reinstall all the necessary software, you’re looking at spending most of your night at work. Well, maybe you don’t have to rebuild your server after all. Winternals ERD Commander 2002 allows you to perform advanced troubleshooting long past the point where most troubleshooting methods fail. ERD Commander works its magic by allowing you to boot from its CD to any FAT, NTFS or CDFS partition. ERD Commander bypasses the local operating system, allowing you to repair a damaged, unbootable system. However, it doesn’t work with corrupted disk. Unlike Recovery Console, ERD Commander isn’t limited to accessing the %systemroot% and %windir% directories. Also, ERD Commander doesn’t require knowing the administrator password. From within ERD Commander, you can reset file or folder permissions, stop or start services, manage drivers, and update locked files. The Locksmith tool provided by ERD Commander alone is worth the price of the product. Locksmith allows you to change local user account passwords. Next time you are at a customer’s site and they don’t know the administrators password, whip out your copy of ERD Commander and change it. 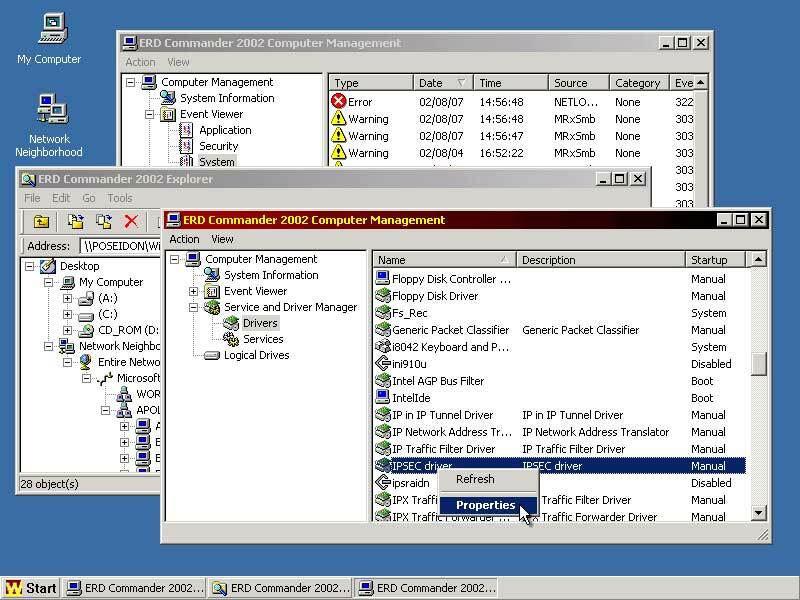 ERD Commander 2002 will work fully with Windows NT 4.0/ 2000/ XP. It requires at least 64MB of RAM and at least a 233MHz CPU. 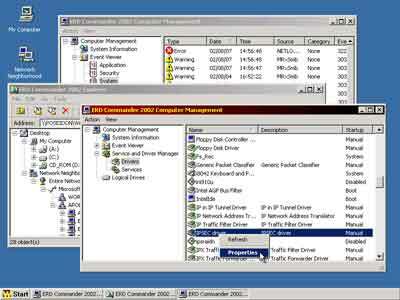 You can use ERD Commander to access the drives of Windows 95, 98 and Me systems, but you’ll have limited functionality. One warning when using ERD Commander on a Windows NT 4.0 machine: When you run ERD Commander 2002, it updates the current version of NTFS to a version only supported by Service Pack 4 and above. If your servers don’t have at least SP4 installed, they’ll be rendered unbootable after the upgrade. I also love the way Winternals handles the licensing for ERD Commander. The price per license is $399.99. The license isn’t tied to a machine or a company. It’s tied to the administrator. The administrator can use his or her copy on as many machines as they want. This isn’t a cure-all, but it’s one of the best tools for the money I’ve seen. All too often, administrators rebuild servers because they can’t figure out how to fix them. ERD Commander makes it easy to point and click your way through repairing a server.